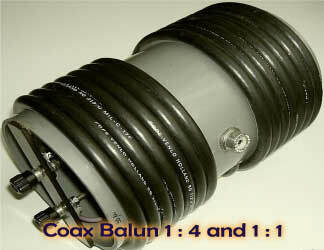 An air-wound balun made with coaxial cable can not become saturated because no powder iron or ferrite core is present. The system consists of two equal lengths of coaxial cable which are connected in parallel on the one side and in series on the other. If 50 ohm or 75 ohm coaxial cables are used transformation takes place of respectively 25 ohm : 100 ohm and 37.5 ohm : 150 ohm.